I noticed on my way from my porch to the bus stop earlier this week that birds are starting to sing in the morning. At 6:30 it is still dark but a few voices are sleepily chirruping hello in the pre-dawn. This made me so happy that I would have danced my way down the sidewalk if it weren’t for treacherous slicks of ice hiding in the shadows. We might be having a thaw this weekend —it’s 40F/4C as I write this — but spring is still two months away. Still, one must plan and prepare. Today I began folding newspaper pots for starting seeds. In just two weeks the onion seeds will need to get going. Last year I got started late with the onions and the late start combined with putting them out when they were too small meant I ended up with no onions at all. Not having grown onions before, it was all trial and error. Mostly error. This year I try again and see if I have any success. 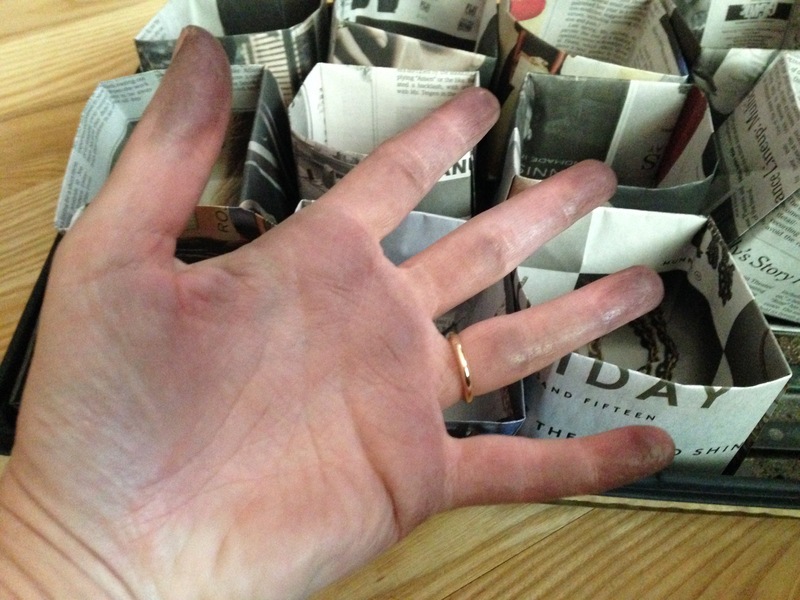 Folding pots out of newspaper is messy and a bit tedious after the first pot or two. What does one do to entertain oneself? Watch the Secret History of the British Garden of course! I just watched the third episode about the 19th century and there is only one more episode left and that makes me very sad. A few years ago I watched and loved A Year at Kew. There are three seasons of this marvelous show and if you haven’t seen it, I highly recommend it, especially on a cold winter’s day. Why can’t Americans make good gardening shows? It’s not like we don’t have any spectacular gardens. I almost titled this post “Pot Making” but decided it might give the wrong impression. Have I ever told the story about my pot garden? Way back before Bookman and I bought our current house we had a townhouse with a large south-facing deck. We began container gardening on it before container gardening became a thing. To me at the time it was growing plants in pots. We were at a social event once, I don’t recall the exact occasion, but I was talking with someone and said with great enthusiasm that I had a pot garden. The astonished look on the person’s face and her sudden loss of words made me realize what I had just said. I quickly explained I was growing tomatoes, peppers and herbs in pots on my deck. I wasn’t entirely certain she believed me. I beat a hasty retreat. I have lost my gardening journal. It had three year’s worth of notes and plant lists and plans in it. I have no idea where it has got to. I have looked in all the likely places more than once and even in unlikely places too. It never leaves the house and my house isn’t that large. The last I recall seeing it was during the summer on my reading table. Bookman kindly surprised me with a new notebook that even has a pocket in it, very handy. But I remain nonplussed about the missing notebook and terribly sad about not only the disappeared garden notes but also reading notes. My hope is that it will turn up eventually and I will wonder why I failed to look for it in that location. In the mean time, planning for this year’s garden moves ahead. I have begun a list of things that need to be done once the ground thaws. Last year at the Friends School Plant Sale in May we bought a few shrubs in anticipation of our garage being knocked down and an expansion of garden space. It took far longer for that to happen than we expected so we had to plant the shrubs in a temporary location in the main garden. They will need to be transplanted into what we now call the chicken garden. The list keeps growing every week. Spring is such a busy time! And speaking of the Friends Plant Sale, I got the save the date postcard in the mail during the week. It is magneted to the refrigerator door where Bookman and I can see the date and the photo of the beautiful flowers. Every year I think it will be the year when I get to finally plant up my front yard and pack it full with prairie flowers and grasses and every year it gets put off. This year it is being put off again because I need to plant a green roof instead. I have already begun a list of plants I know will be good but looking at the catalog when it becomes available at the end of March will be when the planning really happens. Lots of things in the works and the closer spring gets, the busier I will be. But it is all fun and I love it or I wouldn’t do it. In cycling news, 250 Kung Fu nuns biked 2,000km in India to spread a message of women’s empowerment and environmental conservation. They are amazing and inspiring women. I am thinking about gardening too — and would love for you to title a post “pot gardening” — I would’ve thought about making your own pots too! Or maybe marijuana enthusiasts could consider growing different herbs and plants? Looking forward to your garden planning! cirtnecce, heh, totally illegal in Minnesota but not in Oregon or Colorado. The nuns are amazing! I used to have a potted plant collection in my apartment balcony when I was living in Pune, Maharashtra. I mostly enjoyed growing herbs. Gardening is such a lot of fun! I would love to read about your Pot Garden 🙂 And I also like the idea of a gardening journal. Geetanjali, for the longest time I didn’t keep a gardening journal. When I finally did start I realized how useful it is to have a place to collect information about what I grew, how it did, things that went wrong and right, as well as notes from books I read about gardening a lists of plants I might want to try. I really do hope my lost one turns up! Hi Stefanie, the ‘pot garden’ anecdote made me laugh. 😀 I have never had a garden. So, I am always in awe of those who adore gardening. I love your posts on gardening. Thank you for sharing your thoughts. Deepika, glad you enjoyed the pot story 🙂 And I am glad you enjoy my garden posts. Perhaps you might have a garden of your own sometime! The nuns are really amazing, it would be awesome to go on a ride with them! I hope your notebook turns up. I’ve eventually found things in unlikely places, such as in between folded towels,, obvioulsy having been gathered up into the pile inadvertently. piningforthewest, I hope so too! I would have to eventually. I am hoping it is stuck inside a book or catalog or something. I hope you can find your journal and that the onions will be a success this year! Iliana, heh the look on the person’s face when I said I had a pot garden was priceless! Thanks! I hope the journal turns up eventually and my fingers are crossed regarding the onions! You gave me a good chuckle, too. Just yesterday I was thinking it’s time to start seeds!! I never got the knack for folding paper seedling pots. I save up toilet paper tubes and use those- most plants they just go straight into the ground. How does the newspaper not start falling apart before your seedlings are big enough… ? Jeane, glad you got a chuckle! The newspaper pots are quite sturdy. With all the folding the bottoms turn out pretty thick and the sides are all double layered with some places being even thicker. They are really easy to do. I found a great video on YouTube. Be glad to send you the link if you’d like. It sounds like you have a good solution though! Haha, Stefanie. Loved your pot garden story.